The Jim Taravella Award is in memory of the former Monroe-Woodbury boys varsity basketball coach Jim Taravella, who passed away unexpectedly on December 13th, 2006. The selection process is conducted yearly by the varsity basketball officials of the Orange County Basketball Officials Association. The award is based on a boys varsity basketball coach that exemplifies the coaching qualities that Jim Tarevella possessed — such as dedication, sportsmanship, and compassion in the role as a coach in the game of basketball. 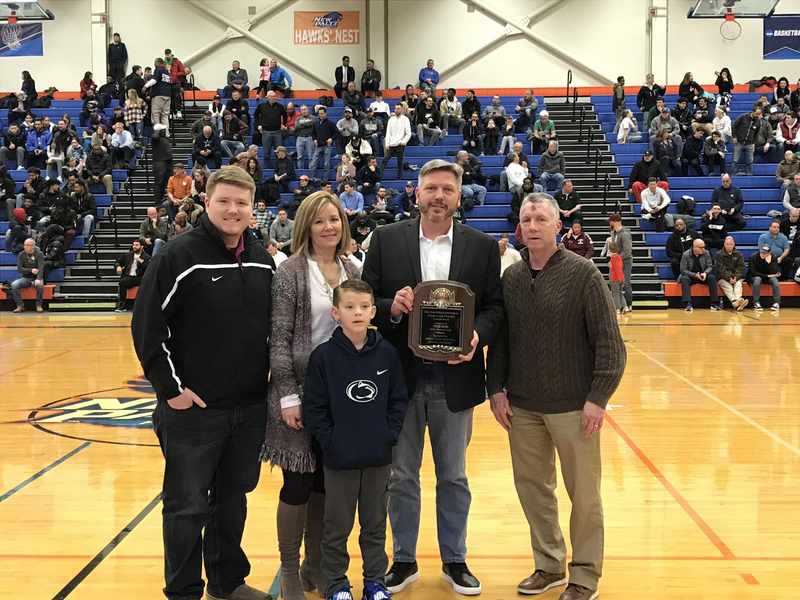 The 2018-19 recipient of the Jim Taravella Award is Washingtonville Boys Varsity Basketball Coach Todd Rose. Todd Rose, middle, with his family to his left. “Coach Rose is a gentlemen in its purest form, and the perfect recipient for the Jim Taravella award. My junior year at Washingtonville, I was on the varsity golf team he coached, and was the team manager for the varsity basketball team a year later. Two years later, I come back to Washingtonville games to talk about basketball, and sometimes about life in general. He has done an amazing job with the Washingtonville boys basketball program in his 14 years at the helm. He is a role model, and a father-figure to me, and I couldn’t think of a more deserving person for this award. Next Moore & Short Combine for 37 in Kingston’s First Section 9 Class AA Title since 2012-13.